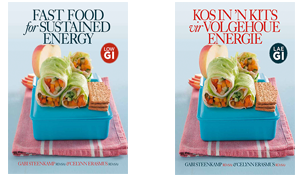 Gabi Steenkamp together with her colleagues, has written 11 books, the latest one being THE BEST OF EATING FOR SUSTAINED ENERGY. 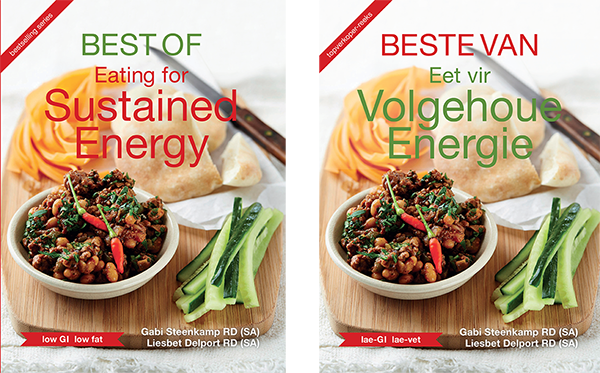 All of Gabi’s books will inspire you to easily put into practise good taste with good nutrition. “Nutritious and delicious” takes on a new meaning, when Gabi teaches you how. Thank you so much, I received the books in excellent order. Thank you for your speedy service, it was good to do business with you and will most probably do business with you again. Just a great big thank you for my books that I received this morning! The recipes are user friendly and I can’t wait to start cooking!! Thank you for the great service! This book helps you understand how your gastro-intestinal tract functions and how to cope with tummies that don’t behave as they should. Filled with delicious recipes based in science and embedded with basic good nutrition principles. 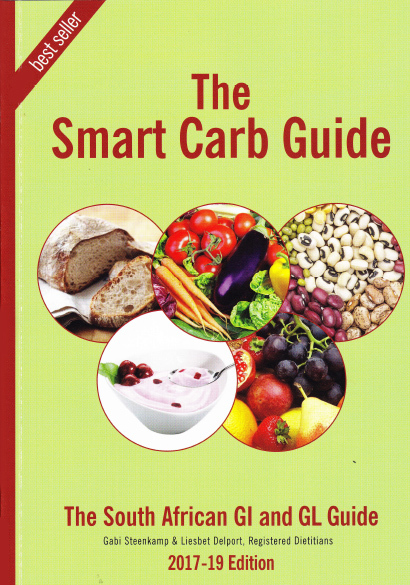 It also includes a section on the FODMAP diet. 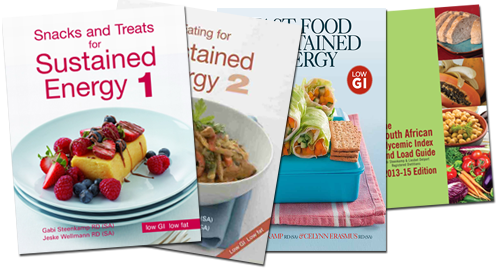 A collection of our publishers favourite recipes from the four Eating for Sustained Energy low GI low fat recipe books, Eating for Sustained Energy 1, 2, 3, and 4. The book contains recipes for the whole family based on the glycemic index, glycemic load and low fat cooking principles. Healthy nutritious easy cooking for all, including those with diabetes, heart disease, high cholesterol, ADHD, chronic fatigue and those wishing to lose weight. The recipes in this book are truly South African and suitable for everyday family meals. An everyday recipe book for the whole family based on the glycemic index, glycemic load and low fat cooking principles. Healthy nutritious easy cooking for all, including those with diabetes, heart disease, high cholesterol, ADHD, chronic fatigue and those wishing to lose weight. This book also has truly South African recipes suitable for everyday meals for the whole family. 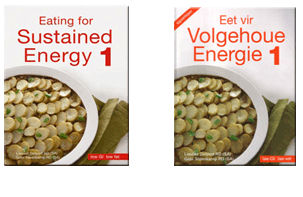 This recipe book for the whole family follows on from Eating for Sustained Energy 1 and 2 due to popular demand for another set of recipes. 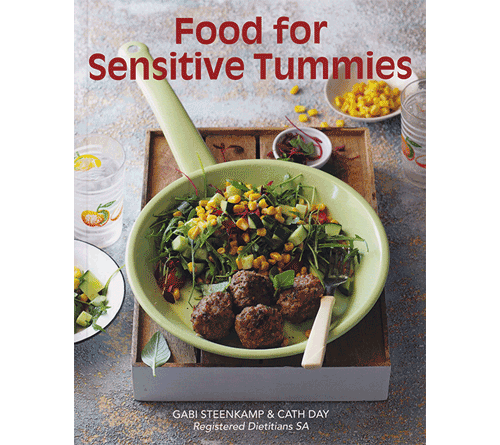 Filled with delicious flavour fusions both South African and continental, this low GI low fat recipe book is sure to tickle your tastebuds. Quick and easy to prepare dishes so that your family can enjoy modern food trends the healthy way. 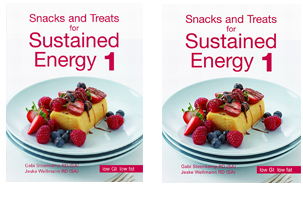 This 4th recipe book in the series is suitable for the whole family and follows on from Eating for Sustained Energy 1, 2 and 3 due to popular demand for another set of recipes. 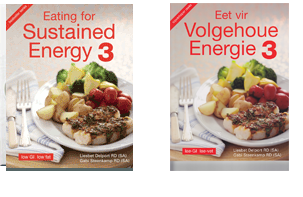 Filled with delicious flavour fusions from both South Africa and Europe, this low GI, low fat recipe book is sure to keep you and your guests amazed at the good taste of good nutrition. Quick and easy to prepare dishes so that your family can enjoy modern food trends the healthy way. This book was nominated as the best nutrition cook book at the Paris Gourmet Cook Book Fair. This is the party book the health conscious have been waiting for. It is filled with delicious sweet and savoury snack foods for any party – a children’s birthday party, an 80th birthday tea, a cocktail party, or even a wedding. This book of delicious and healthy lower GI lower fat and portion controlled snacks will make catering for any occasion easy and surprisingly fun. From the luscious cheesecakes to the unusual pancake bites, every bite will delight. This book is also designed for use by those baking for home industries and for those coffee shops that wish to offer their clientele a healthier option. 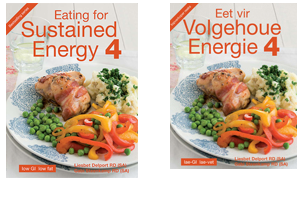 Sustained Energy for Gluten-free eaters is a gluten-free recipe book written by dietitian Liesbet Delport and Sharon Alderson who has Coeliac disease. The challenge with gluten-free recipes is that characteristically they are high GI and high in fat. 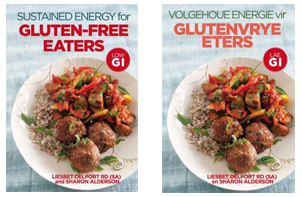 With the help of Liesbet’s extensive experience in developing low GI recipes this book is filled with the healthier low GI and gluten-free recipe options. Enjoy take-away foods like pizzas, hamburgers, bacon and eggs (and even muffins!) in the right portion size and with the right accompaniments, and you can still be healthy, full of energy and keep your weight under control. The book contains an extensive section with pictures of fast foods and their nutritional attributes and then the correct way fast foods can be eaten – all fully illustrated with pictures for easy reference. The most handy book to modern healthy eating where meals are assembled and not cooked from scratch. A user friendly book written with you in mind. The most commonly eaten foods in SA are listed in an easy-to-use, cross-referenced, colour-coded, alphabetical list. In addition, the glycemic index and glycemic load concepts are explained in clear layman’s terms with plenty of examples to help you implement these new nutritional tools into your daily eating. We have now also listed the carbohydrate, protein, fat, fibre and kilojoule content per portion size indicated in the lists. 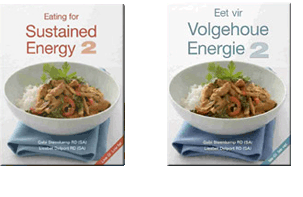 A neat easy-to-use GI and GL guide for all South Africans, written by two experienced South African dieticians.